Known as the Barnacle Maggot (Oedoparena glauca) this small intertidal fly is big problems for the local barnacles. 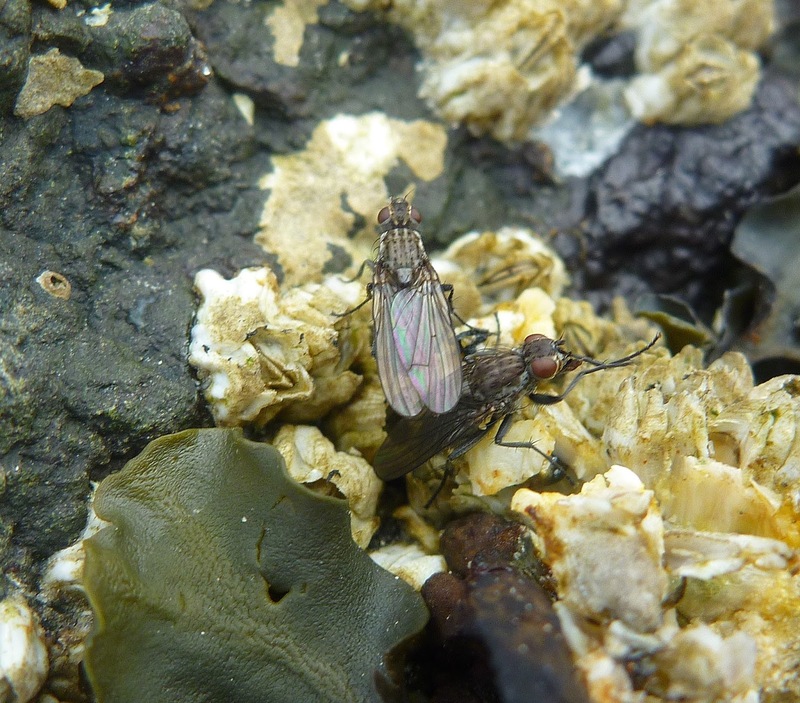 At low tide the adult female lays eggs on the operculum plates of the barnacle. The eggs have flanges that allow them to become lodged in cracks between the barnacle's plates. The eggs hatch within 48 hours at low tide. 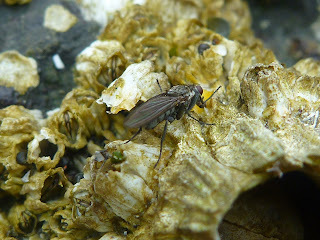 The fly larvae (maggots) enter the barnacle by wiggling through small gaps between the operculum plates and proceed to feed on the soft flesh of the barnacle. After feeding on the barnacle the maggot leaves and crawls to another barnacle at low tide and wedges itself into gaps in the plates....when the water returns the barnacle opens to feed and the maggot crawls in....to feed on a second barnacle and then more. After a few months the maggot pupates inside the last barnacle meal shell. In a month the maggot will mature into the adult and exit the barnacle shell at low tide. Studies have determined that as many as 20% of the acorn barnacles on a beach may contain the maggots. Golden Gardens beach in Seattle had the highest rate of predation of beaches surveyed in one study. Barnacles that contain a maggot cannot feed because their access to the outside is blocked by the maggots breathing apparatus.